In October 2017, The Hoof Blog reported on experimental research looking into direct-injection gene therapy for soft tissue lameness injuries in horses. The authors of the 2017 paper had successfully cured lameness in two horses and published their results in the journal Frontiers in Veterinary Science. The 2017 research detailed the first time that gene therapy had been used on lame horses; the technique is very advanced. In human medicine, gene therapy treatment is still under development, with only three human trials to date. While the work on horses looked very promising, the team of clinicians and scientists wanted to continue the work using a larger group of horses to look at the reason why the gene therapy worked and to see further results in more horses. Nearly a year later, the collaborative team from Kazan Federal University and Moscow State University, both in Russia, and The University of Nottingham in the United Kingdom have published the results from the larger study and it is equally as exciting. Photo courtesy of Professor Catrin Rutland, University of Nottingham School of Veterinary Medicine and Science. This time the team treated ten horses suffering from severe injuries of the suspensory ligament branch or superficial digital flexor tendon. All of the horses had received these injuries naturally and were a mixture of racing, dressage and companion horses. 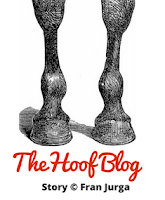 HoofBlog/HoofSearch have stayed in communication with the authors through the last year and can now provide an update on this research. The team had previously developed a plasmid with equine genes inserted into it which they were able to inject into the tissue that had torn. 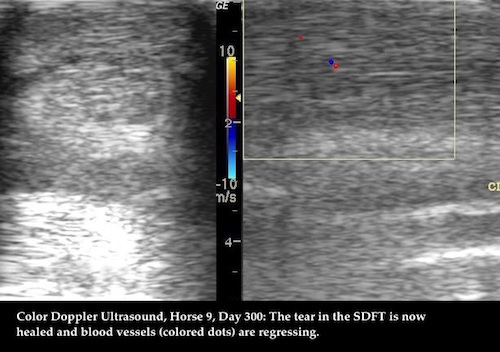 When the VEGFA164 and FGF2 genes were expressed in the horse, the team saw that the tendons/ligaments were healing quickly, without the scar tissue often observed, and that blood vessels had developed due to the treatment, which aided recovery. Professor Albert Rizvanov of Kazan Federal University in Russia led the study; he said “It is essential that we used horse genes to create this gene therapy treatment. By using species-specific genes we ensured that proteins which are being synthesized are natural for horse and won’t cause any unwanted immune reactions”. 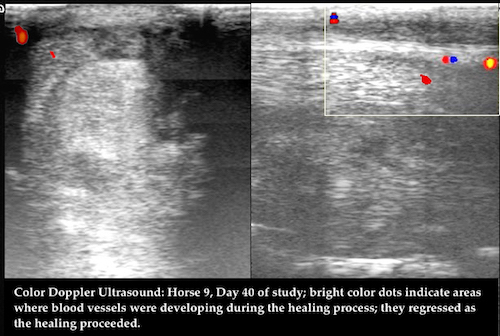 The research used techniques such as veterinary examinations, ultrasound, color Doppler imaging and additionally asked the owners their opinions on their horses levels of fitness and recovery. Each horse was studied for 12 months to ensure that not only had recovery been achieved but also that it remained healthy once it was back to jumping/racing/normal exercise and competition. Only one horse showed a small reaction to the treatment, but this was a small amount of swelling at the point of injection and can be caused simply by insertion of a needle. Therefore the horses are not reacting negatively to the plasmid and DNA. Because the treatment is aimed specifically at horses, it was hoped that there would be no negative reactions. Eight of the ten horses were returned to pre-injury fitness and competition level. 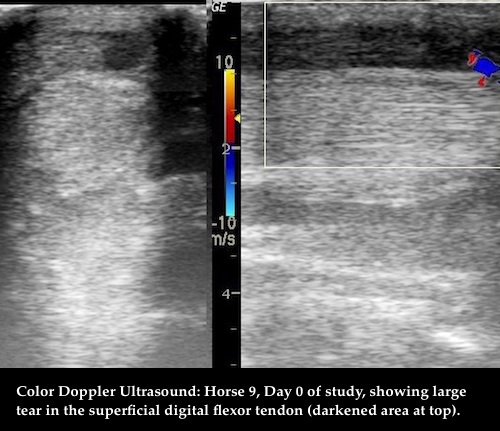 The healing rates changed a little between the horses and depended on their initial injury and lameness levels but, on average, horse lameness had significantly improved by day 20, reducing by half in the suspensory ligament branch horses and to just a quarter in the horses with superficial digital flexor tendon injuries and in most of the horses the lameness disappeared completely at between day 20 and 90. Two horses were not given completely clean bills of health. One horse improved and had been fully rehabilitated; the tissue had healed and it was not lame, but it sustained a completely unrelated injury six months into the study. Although it was an unrelated injury on another limb, the authors could not report that this horse was back to pre-injury level. In the case of the second horse, the lameness and injury had not significantly improved and the tissue had not regenerated fully; this horse did not get back to its pre-injury levels. Catrin Rutland, BSc, PGCHE, MSc, MMedSci, PhD, SFHEA, FAS is an Associate Professor of Anatomy and Developmental Genetics at The University of Nottingham. She said: “Gene therapy is highly innovative and exciting. This work in horses is essential as the genes were specific to horses and really address an important issue for the equine community. We are delighted that our publications in (the) Frontiers in Pharmacology and Frontiers in Veterinary Science academic journals have been so well received by the scientific, medical and equine communities”. Summary: The key to this treatment is enabling the tendon/ligament to heal while not creating the wrong type of collagen in the wound. This is something that the body does but causes long-term weakness in the tissue, which is why the area is more likely to get injured again. The research team saw that the “wrong” collagen was not created when using their gene therapy. This all adds to the evidence that this gene therapy treatment is safe, effective and is very promising for the future. The research was funded through a Program of Competitive Growth at Kazan Federal University but the next step for the team is to find funding to conduct more research and, ultimately, get it out into clinics and veterinary surgeries. The Open Access research paper, Gene Therapy Using Plasmid DNA Encoding VEGF164 and FGF2 Genes: A Novel Treatment of Naturally Occurring Tendinitis and Desmitis in Horses, will be available for all to read online at the Frontiers in Pharmacology website on or about September 1, 2019: https://www.frontiersin.org/articles/10.3389/fphar.2018.00978/full. Currently, the abstract and publication details are available and the publisher has an option for readers to be notified when the full article is posted. Thanks to Professor Catrin Rutland for her assistance with this article. Photographs were provided by Professor Rutland and the other authors and will not be seen in the journal article. The researchers are not presently able to take in horses for new trials but updates to the research may be found on Twitter, Facebook and a dedicated website. If you would like to read more about gene therapy in horses, the team members were also invited to write an editorial for the journal Equine Veterinary Education: https://onlinelibrary.wiley.com/doi/epdf/10.1111/eve.12912 (sign-in required). Kovac, M., Litvin, Y., Aliev, R. O., Zakirova, E., Rutland, C. S., Kiyasov, A. P., & Rizvanov, A. A. (2018). Gene Therapy Using Plasmid DNA Encoding VEGF164 and FGF2 Genes: A Novel Treatment of Naturally Occurring Tendinitis and Desmitis in Horses. Frontiers in Pharmacology, 9, 978. Click here to follow the research project's Twitter feed. Click here to go to the researchers' Facebook page. Click here for the dedicated website (equine lameness section under construction). 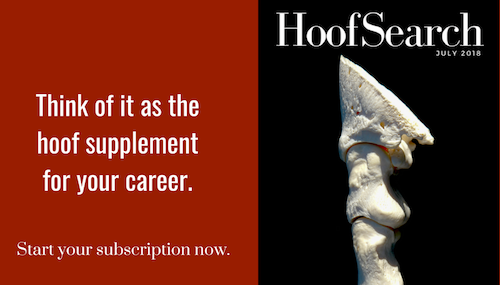 HoofSearch is the interface between working professionals and researchers. This monthly compilation of newly published peer-reviewed articles, conference proceedings, theses and patents keeps readers informed and gives them links and resources to learn more about individual projects or publications. Click here to subscribe now.